Naftali was the son of Abraham David Keizer (1828-1914) and Alida Polak (1826-1900). They were married in The Hague (Den Haag) in 1856 and had seven children: David, Julia, Henriette, Naftali, Rebekka, Jette and Alexander. Abraham and his family lived like his father and grandfather at 13 Woldstraat. Father Keizer played an important role in the Israelite Poverty Committee; he was secretary-treasurer. In 1899 he celebrated his 40th jubilee and kept this function until 1905. In that year he was replaced as secretary-treasurer by his son Naftali, who would not only take care of the weak in the Jewish community, but was (like his father) a textile trader, auctioneer, weight-master at the butter market and sales agent for the Staatsloterij (national lottery). 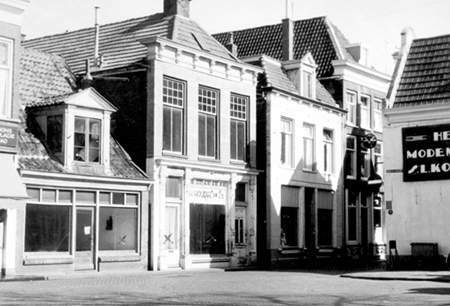 During the Second World War only Naftali and Rebekka still lived in Meppel; both were single. Until 1936 they lived on Woldstraat and then at 38 Heerengracht. The little house was for many years the shop of Naftali Keizer. Within the framework of his job at the Israelite Poverty Committee, Naftali helped Jewish refugees that came to Meppel after 1933. The Dutch Jews, being wealthier and mostly more distinguished, received the German and Austrian Jews with some suspicion; some even called them ‘Blutjoden’ (‘broke Jews’). Initially they established themselves mostly in Amsterdam, later they were taken to the specially built camp Westerbork. A few of them tried to reach Amsterdam via Meppel. Naftali Keizer, who was then living in Woldstraat, had instructions from the church committee, to give aid and assistance to these people, thus continuing a long family tradition. From 1933 onwards many Jewish Germans, often came to Meppel by tram wearing traditional Jewish costumes. They mostly came from Bentheim and via Coevorden they came to Meppel. Often passers-by, were asked for help, but they already knew what the question would be: ‘Are you going to Naffie Keizer?’ The answer was nearly always affirmative. 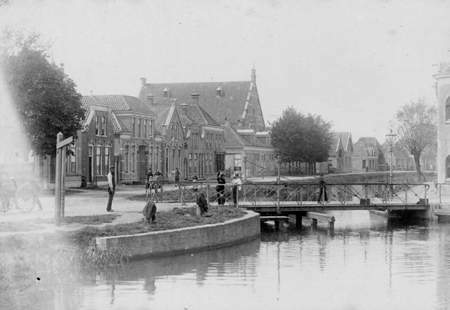 They were then sent via Emmastraat towards the Meppel tower, and had to report in the square east of the tower called the Wheem where the man lived who would help them to get on the night boat towards Amsterdam. At the beginning of the War Naftali and his sister Rebekka moved from their small shop at the corner of Woldstraat and Wheem to 38 Heerengracht. We don’t have a lot of information about them; they were elderly people. It is a well-known fact that in 1941 Naftali was summoned to hand in his antique goods  15 pieces  including some beautiful ones. Naftali wrote, when it appeared he had handed in his antiques by mistake. The goods on the enclosed list have been handed in by mistake to the delivery office on Catharinastraat. These objects have been set aside. I kindly request to be informed if these objects have to stay where they are, or if I can take them back. Naftali Keizer’s letter requesting in vain the return of the antiques, which were handed in by mistake. According to the guideline sent on the 14th of August from the secretary general of the Department of Home Affairs, goods that have been handed in by the public, also when of great scientific, historical or of artistic value and objects considered as goods of national interest are not to be returned or made available to a museum. The objects mentioned, see also module II, can therefore not be returned. Naffie did not get his antiques back. In the meantime they had been sent to a museum expert in Groningen and were probably sold on to collectors later on. When in September 1942 the Germans confiscated their house on Heerengracht, Naftali and Rebekka moved in with the Sanders family on the 2nd Hoofdstraat (number 44a) for a few days. Naftali was now eighty years old, and was saved from the labour camp. On the 3rd of October, brother and sister in the company of Mrs. Sanders were taken from the house to the station: a one-way ticket to Westerbork. It was probably too much for Naftali, who died at Westerbork. 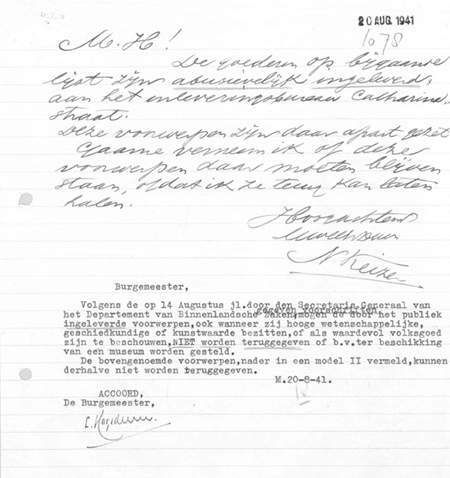 In the document collection of the Jewish Historical Museum, number 3397, the Death and Burial Register of the Jewish Community in Assen, mentions: Naftali Keizer died on the 8th of November 1942 at the age of 80, camp Westerbork. On the 10th of November he was buried at the Jewish Cemetery in Assen (Z.O. 6-47). Rebekka, who was then 72, was probably by his bedside caring for him. After her brother’s death, she remained in Westerbork until the 4th of May 1943. The little glimmer of hope was extinguished when she was sent to Sobibor, where she died on the 7th of May. Recently it was discovered that Naftali and Rebekka  probably together  had hired a safe at one the banks in Meppel. This safe was broken into in 1942 by order of the Germans and its contents  valuable papers, jewellery and other valuable objects  were taken and disappeared without a trace.